Warhammer: Vermintide 2 offers a pleasant surprise with its diverse playstyles and tactical combat; however, it’s hindered by arbitrary difficulty and careless design. The game can be defined as Left 4 Dead meets Diablo in the Warhammer universe. The style is heavily inspired by Left 4 Dead, and the character selection, classes, equipment, crafting, and difficulty settings are similar to Diablo. The opening cutscene begins with a quick exposition of Vermintide’s world and how the heroes defeated Rasknitt, leader of Clan Fester, in the first installment—a smart move to introduce new players to the franchise. In Vermintide 2, the Rotbloods—giant buff warriors that act like zombies with swords—team up with the presumed dead Rasknitt and capture the heroes. The Rat-Buff team destroy the heroes’ original hub and create a dysfunctional Skittergate—a teleporter used to advance their troops to the front line. The five heroes are tasked with destroying the Skittergate before it’s operational and wiping out Clan Fester and the Rotbloods before they take over the world. From a plethora of combat skills to cosmetically changing and enhancing weapons, Warhammer: Vermintide 2 grants endless variety. You're given the choice between five heroes with three careers per hero. Every five levels, players get a talent point up to level 25. The roles that a player can take are similar to any RPG, whether it be a tank, ranged/melee dps, or even a healer. Although there’s no direct healing ability, some skills can be manipulated for that purpose, such as Markus’ Morale Boost which grants everyone temporary health. Vermintide 2 provides a fleshed out combat system that requires the player to dodge, block, and shield-bash while effectively using career skills, bombs, status potions, and ranged weapons in order to survive. The three combat mechanics are relatively simple, although they require precise timing and strategizing among your fellow players to be used effectively. Your shield and shield-bash run on a stamina bar—determined by your weapon—and when it's depleted you’re defenseless. Ideally, players want to pace their attacks, blocks, and shield-bash in an attempt to reserve stamina, preventing critical damage. Specials and tanks make this more challenging, as you consume more than one stamina bar upon blocking them, which is where the dodge mechanic comes in. Dodging costs nothing, but is incredibly difficult to master and is only effective short range. It feels almost useless on enemies with wide attacks. You must also pair these three mechanics with the timing of your career skills. Career skills are basically super-moves. For example, the Ironbreaker has the ability to taunt and gain a 10 second defense buff where he’s allowed to block any attack. And the Unchained has the ability to explode, dealing damage to surrounding enemies. There are 15 skills in total across all characters and careers, which gives the player a chance to experiment with different playstyles. The catch is that they have to level up the characters individually before they can unlock each career, which can be quite grueling. To continue down the list, there are two types of bombs, regular and incendiary—pretty self explanatory. The status potions consist of strength, speed, and concentration. Strength increases attack damage, speed increases movement and attack speed, and concentration increases the charge rate of career skills. Potions last exactly 10 seconds before their effects wear off. Guns and bows are a little complex because they act as the main weapon for certain careers. However, since ammunition is scarce, it’s better to save ammo for special enemies and tanks. Ranged weapons like the blunderbuss are meant for crowd control, except it doesn't really control much, as it can only pierce through a couple of enemies. The rifle is clearly superior since it can snipe specials from across the map and even pierce through multiple, effectively making the blunderbuss useless. Behind all of the mechanics are some solid RPG elements that were quite surprising to see. There are two weapon types—melee and ranged—and three armor pieces. You’re able to salvage, craft, re-roll properties and traits, upgrade, and apply cosmetics to all of your weapons and armor. Your character has their own outfits and portraits as well, for cosmetic purposes. To get access to better gear, you must complete missions. After succeeding, you’re rewarded with Spoils of War—a chest that is upgraded based upon added difficulty modifiers. Warhammer: Vermintide 2 can be a little overwhelming with how much it has to offer, yet it’s necessary in order to combat the insane difficulty. This game is not simple nor is it easy. To put it in perspective, it took me around 11 hours to finish the first act, which is comprised of two hours of content. The difficulty can be attributed to the lack of teamwork, good gear, and those damn Bile Trolls. Bile Trolls are one of the tanks that Vermintide 2 has to offer. The variety of tanks force the player to improvise in each scenario. They range from a simple Rat Ogre—Left 4 Dead-esque tank—to an unstoppable Bile Troll that constantly heals and pukes deadly poison everywhere, which can end a 30 minute long run in a heartbeat. Along with the horrifying tanks comes specials, similar to Left 4 Dead. The most painful to deal with are the Sorcerers, who create poison tornados on the map, and the heavily armored Rat Warriors, who take a ridiculous amount of blows before you hit their weak spot. To top it all off, there are hordes of rats that randomly spawn on the map whenever a loud horn is blown. Once you get past the first three missions of an act, the final mission ends with a boss fight. Fighting a boss is essentially like fighting a tank paired with the abilities of a special. The most memorable, and by far the hardest, is the Act I boss. He fires poison projectiles from every direction, shoots bugs that follow the player, and constantly teleports around the room. Not to mention the endless horde of rats that flood the boss arena. Basically, anything that shoots poison at you is the absolute worst thing to deal with. If the baddies weren't enough, there are also difficulty modifiers that enhance rewards. There are two ways to do this: Heroic Deeds, specific missions with modifiers like players taking periodical damage over time, and Tomes and Grimoires, which are in-game items that suppress health and healing upon pick-up. Upon mission completion, these are factored into the quality of the loot through a leveling system. The modifiers are a wonderful option for tactical farming, but feel ridiculous since it's already plenty difficult, especially at the start. That’s where I noticed how arbitrary the system actually is. Essentially, you will die over and over again until you get better gear to overcome your foes. While that may seem like the typical format, it shouldn’t happen in the very beginning, halting your progression at the first mission for several hours. This is disappointing because the combat mechanics are fleshed out enough to require skill to master, so even if you know what you’re doing, you will die. A game based solely on skill, such as Dark Souls, gives the player room to improve without repetitive endless farming out of despair. Any of these elements can end your hard work so easily. It’s the most devastating thing to lose all of your progress and get little to no reward out of it, but surviving is reliant on solid teamwork. If you’re not a fan of talking in-game, this is not for you. You need to be able to communicate, stick together, and manage item distribution, like healing, ammo, bombs, and status potions. If you’re so much as a couple of feet away from your partners, you can easily be swept off by a special, such as the Hook Rat—a Left 4 Dead Smoker-type—who drags you away. After three of your teammates get wiped out, it’s nearly impossible to rescue them unless you’re incredibly lucky. While Warhammer: Vermintide 2 can be mistaken for a repetitive mindless action game, it requires you to be on the edge of your seat. If you don’t work together and master mechanics like blocking and dodging, you’re going to waste so much time looking at the “defeated” screen. The underlying problem of Vermintide 2 is that it feels soulless. With cheesy characters and an endless array of bugs, this project needed more time and development before its release. The story, as well as the characters’ names, are forgettable. It’s not presented in an interesting way, nor is it captivating. Olesya, the person who instructs the heroes and teleports them to safety throughout the whole adventure, is located in the hub and I didn’t realize that until I finished the story. It’s as if the game wants you to speed past the exposition and just play. Usually that’s a good quality, except the story spends so little time on execution that it doesn’t come off as interesting. While Left 4 Dead does this as well, it’s not paired with a massive lore-filled universe that begs to be explored. Despite defeating the final boss, there were no credits nor cutscenes, it simply takes the player back to the hub so they can replay it all over again. Warhammer: Vermintide 2 tries to not be inconvenienced by its story. Some games succeed in doing that, but the player still needs to feel connected to something. The characters occasionally have funny lines like mentioning when a player heals close to full health, yet ultimately it’s quite bland. The artstyle and soundtrack have a similar issue, eliciting a monotonous feeling. The player is further disconnected when these aspects are combined with sloppy programming. The boss is stuck on my body, causing him to infinitely damage my partner, as he cannot complete his grab animation. For example, host migration erases progress entirely. There are no checkpoints in missions, so when the host disconnects, you start from the beginning and lose every reward possible. This makes acquiring good gear all the more exhausting. There needs to be checkpoints for the purpose of reestablishing connection to a new host. Missions can last up to 30 minutes, therefore this is a huge oversight. Losing all of that progress is ridiculous. The biggest kick in the face was when the game pushed an update that crashed Vermintide 2, which erased the progress for that mission. That update was 1.0.2 which effectively nerfed the Bile Troll. And of course, I never saw another one since that day. Despite the inconvenience, it's still continuously being patched, and ever player also received two commendation chests for the update as well. A significantly frustrating issue was being forced to play on a keyboard. For some reason the controller is plagued by an accelerator when you pan horizontally, and the movement is sluggish as well. Controller prompts like accepting the next mission or voting to kick aren’t picked up by the controller. There clearly wasn’t enough time spent on controller optimization in spite of the it being available for PS4 and Xbox One. What really ruins certain aspects Vermintide 2 has to offer is its crafting. For example, I upgraded a weapon and because it had an illusion—a cosmetic skin—it was salvaged without upgrading the weapon. The game still considered the weapon to be upgraded, as it wouldn’t let me enhance it further. When I finally got to upgrade a weapon, it changed from green to blue. However, there was no actual change to any of the stats besides its color, which made my experience with crafting absolutely pointless. Some other clear mishaps include the buggy fullscreen that doesn’t stay fullscreened and the subtitles, being giant blocks of text, that are also inaccurate. Additionally, there is a terrible audio balance between music, dialogue, and voice chat, which needs to be adjusted accordingly per player. Finally, Skittergate bosses are a glitchy mess, which somewhat destroyed the feeling of accomplishment, since the last boss could easily be exploited. Most of these issues are known to the developers, as can be seen on their roadmap page. However, gameplay is the only positive aspect Vermintide 2 has to offer, so it’s discomforting when there are issues like these upon release. 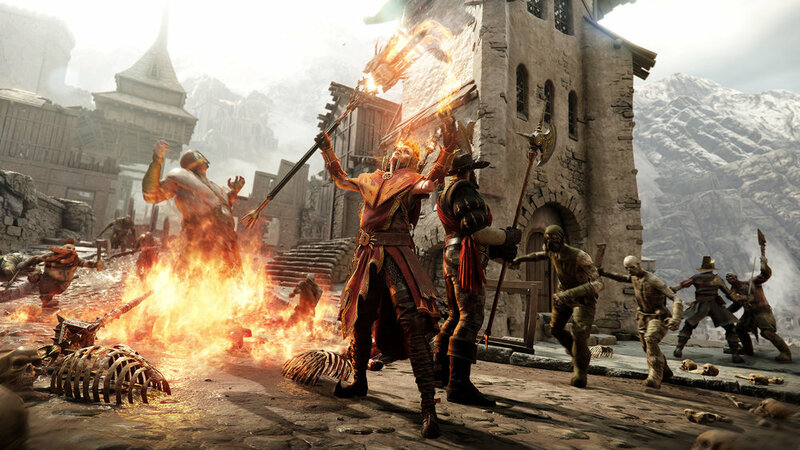 For only $29.99, Warhammer: Vermintide 2 is packed with more content than you’d expect for the given price. Ironically, it’s also well optimized for lesser hardware like the NVIDIA GeForce 940MX. Most of its flaws are fixable, and those that aren’t can be forgiven considering its worth. As long as you have friends to play with, Vermintide 2 can be an intense and thrilling action game that should be replayed on harder difficulties—similar to Diablo—once the appropriate gear is acquired. After you break the difficulty threshold, it turns into an addicting adrenaline ride where you’re slashing your way through hordes of rats to see that beautiful blue bubble—safety and rewards.